Both the Soviet Union and Russia are informal names attributed to longer and more formal labels. “Soviet Union” was a term used as an alternative for the Union of Soviet Socialist Republics, while Russia can pertain to different things; specific geographical location, country, government, and people. Both the Soviet Union and Russia are located between two continents – Asia and Europe. However, there are many differences between the two, despite some common grounds, which include a centralized government with social control united by a military and social ideology. 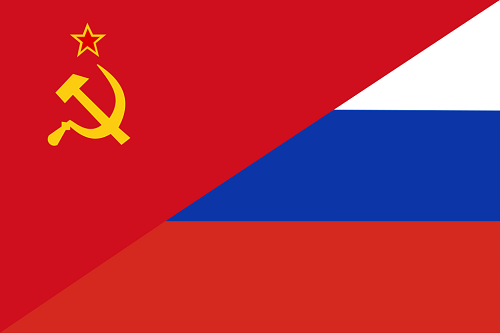 Both concepts were very popular and prevalent during the Cold War (1947 – 1991). These common grounds were evident during the time when both states were in existence simultaneously. The Soviet Union was a union or collection of 15 republics. It existed from 1922 until its fall in 1991. The Soviet Union was basically a one-party state that adhered to the Communist regime of government. In its heyday, the Soviet Union was one of the two superpowers of the world (the other one being the United States of America). Members of the Soviet Union were countries that extended from Germany to the Pacific Ocean. The Soviet Union no longer exists since it was disbanded in 1991. As a result, its member republics became independent countries. As a one-party state and its composition of 15 republics, the Union hosts many cultures and ethnicities in one, singular state. On the other hand, “Russia” pertains to a specific country, government, and society. Currently, Russia is a federation that works under a semi-presidential government headed by the Prime Minister. Russia has a very long history. It has existed as a powerful empire that was brought down by a revolution. After the revolution, Russia joined the Soviet Union as one of its republics. Russia was the dominant state republic during the existence of the Soviet Union. The capital of the Soviet Union was Moscow, Russia, and it is also the seat of government and power. Russia is also the largest of all 15 dissolved republics, even annexing some former Soviet Union members into a federation named the Russian Federation. Up to this day, Russia continues to exist as a country and a government. It has its own culture and traditions that are distinct from those of its former members of the Soviet Union. 1. The Soviet Union and Russia are not one and the same, but they are closely related to each other. Both terms are also informal labels. 2. The “Soviet Union” represented the “Union of Soviet Socialist Republics,” a collection of 15 states that existed from 1922 to 1991. On the other hand, “Russia” refers to a particular location, government, and country in the world. 3. The Soviet Union referred to the whole union and all of its 15 republics. Meanwhile, Russia is just one of these former republics but holds a considerable amount of power. Russia’s city, Moscow, was the capital and center of the government of the Union. 4. The Soviet Union was created in 1922 and disbanded in 1991. It also employed a Communist approach in governance. In contrast, Russia existed before and after the Soviet Union. Today, Russia’s government is a federal republic. In addition, the other republics of the Soviet Union were formed as independent countries. 5. The Soviet Union, with its 15 republics, is a melting pot of culture and ethnicities. Russia has its own distinct culture, identity, and traditions that are different from those of the Soviet Union’s former members. 6. In terms of scale, the Soviet Union was bigger (as a government) and wider (in geographical terms). Russia may be a large country, but it is smaller in comparison to the Soviet Union both in size and in the scope of its government. Celine. "Difference Between Soviet Union and Russia." DifferenceBetween.net. September 8, 2017 < http://www.differencebetween.net/miscellaneous/politics/political-institutions/difference-between-soviet-union-and-russia/ >. Thank you, this helped me in my classes. This is very helpful for my presentation, thank you! I am writing a thesis very similar to this topic. Do you have a list of sources that you used, if any, that you would share?